They are sure-footed beasts of burden, the sightseeing trains. I don't think I understand this my friend...but I think sometimes it is easy to look to hard....However, Understanding is one thing...liking is another...I like this drawing as usual your work is drawn with incredible skill!!!! It is about those little sightseeing trains transporting tourists and being just everywhere - especially in summer. 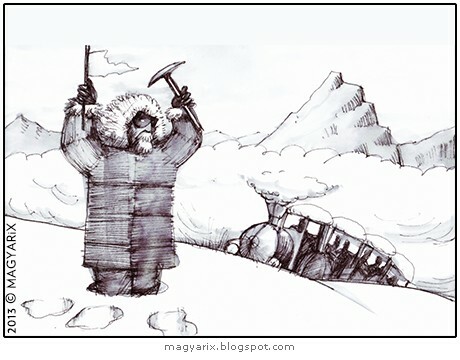 Here they arrive at Mount Everest. Wow...Thats funny...I am a bit slow sometimes..I can see that now!! I got it, and understood its lunacy. It's funny. But it's better now that I know it's the Everest summit. I'd like to buy two 'chances' on the Sightseeing Train, please.